Lil' Blog and More: Review and Giveaway: Family Talk 2. 1 Winner- Ends 1/15 - US Only. Review and Giveaway: Family Talk 2. 1 Winner- Ends 1/15 - US Only. 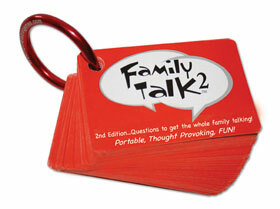 Thanks to Tomoson.com I was able to review Family Talk 2 from Around the Table Games. I did a review of Around the Table Games before, but last time I reviewed Grandparent Talk and Family Talk; You can see my previous review of those 2 games HERE. This time around I got the chance to review the continuation of Family Talk; Family Talk 2. Family Talk 2 is a great continuation of Family Talk. It is packed with lots of new questions. I enjoy asking these questions so much! What I love most about Around the Table Games is that you ask questions that you might not normally ask. Thanks to Family Talk 2, I have learned things about Aaron that I never knew. I've also learned things about my grandparents and mom. Thanks to Family Talk and Family Talk 2, I know my family better then ever. This is a great game to start up family conversations. I really recommend Around the Table Games to bring your family together. There are a few different versions of games. Like Family Talk, Family Talk 2, Grandparent Talk, Teen Talk and More! 1 of you will receive Family Talk 2! Mandatory Entry: Visit the Around the Table Game Website and tell me which game you would most like to try! ﻿Disclosure: Review product was provided to me free of charge to ensure and honest review thanks to Tomoson.com. All opinions expressed are my own, and were not influenced in any way. Only 1 entry PER HOUSEHOLD. Be sure to leave your email address in each comment. I would love to try the Double Deck Tin of Family Talk and Grandparent Talk, that way I would have both games! I have "Liked" Around the Table on Facebook. I have sent you a friend request on FB. I'd most like to try Camp Talk. Thanks. I'd like to try Buddy talk. I would love the Family Talk game! I follow around the table on Twitter! I like around the table on FB! I like the double tin with family and grandparents talk. I like the Buddy Talk Game to get for my neices! Liked Around The Table on Facebook! Follow you with Google Friend Connect! Entered Flowerz in Her Hair! Wobble Over Wednesday! Week 21! Review: Greener Pup XL dog bed. 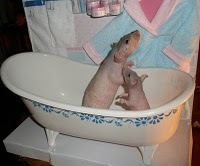 Merry Christmas from My Life with Rats and More!